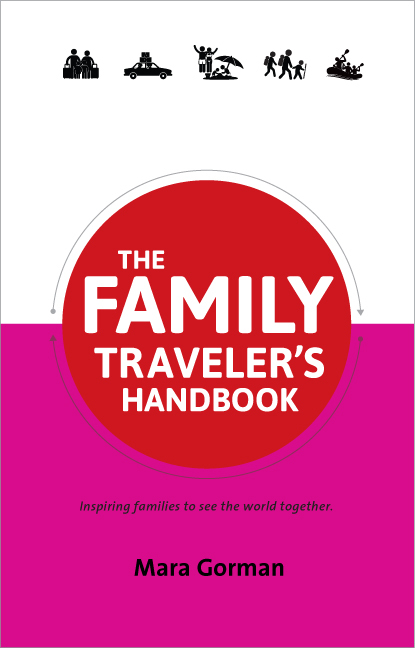 In a few instances on this journey (hashtag: #momtomted) I was given discounted or complimentary stays or tickets to attractions, either by invitation or because I asked. This was true of our stay at the Hotel Monaco Pittsburgh where we stayed for two nights, one of them free, one of them at a discounted rate. You can always count on me to tell you when I’ve gotten something for cheap or free and to also share my honest opinions and stories. I’m a big believer that one of the best ways to see any city is from the back of a bike. You can cover more territory than on foot, but you move more slowly and with freer access than you would in a car. 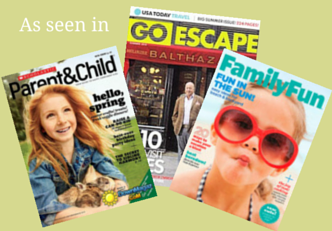 It’s a particularly great way to tour with children because they love being outside and moving. And as more cities around the world become bike-friendly this type of exploration only gets safer and easier – especially because the creation of bike trails in cities usually inspires someone local to start offering tours. Pittsburgh is no exception to this rule; as the industrial areas of the city are repurposed, trails and bike lane are being installed and not far behind these developments came the advent of Bike the Burgh tours. I found this truly small (as in one-person) outfit online and used the website to book a tour for myself and the boys on our first morning in Pittsburgh. 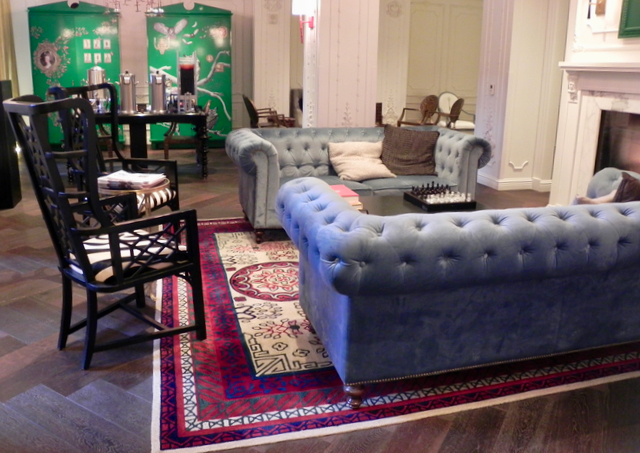 Can you tell why Kimpton Hotels call their lobbies “living rooms”? No, he did not eat all of these pancakes. 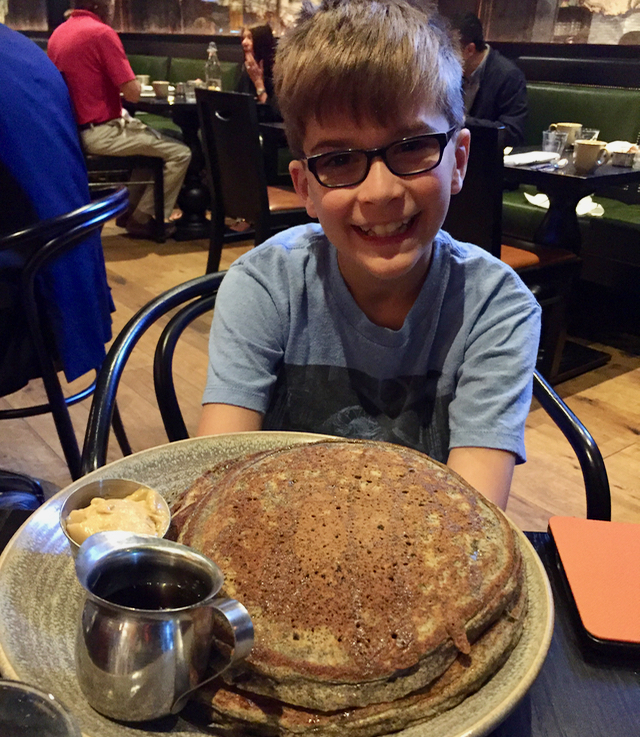 After rousing my children and covering us all in lots of sunblock, as it was another gorgeous but not-too-hot day, we fueled up with a breakfast at The Commoner restaurant that included some of the biggest pancakes I’d ever seen. The valet was kind enough to bring up my car so I could get the bikes off our rack, and we headed off to the designated meeting place, only a few blocks from our hotel at the corner of First Avenue and Ross Street. I know the boys both look bored in this picture, but I think it’s just because they were listening carefully. Our guide was Val, the owner and operator. She is a native of the Italian Alps who studied art and architectural history in Munich and Rome before meeting her husband, a Pittsburgh native. Her enthusiasm for Pittsburgh was that of an outsider who surprised herself by falling in love with her adopted home – she clearly had set out to eagerly learn everything she could about its history and buildings and decided somewhere along the way to make a living sharing that knowledge with people. Her English was flawless and her interest in the city totally infectious. We started our tour with a few stops downtown – including one in Mellon Square, adjacent to our hotel. Val asked us to imagine how dirty downtown Pittsburgh used to be during its more industrial days and told us that in general residents avoided downtown unless they had to for work. Tommy and I were able to chime in and share information about the old Alcoa headquarters building that overlooked our hotel since we had done our research the previous evening. 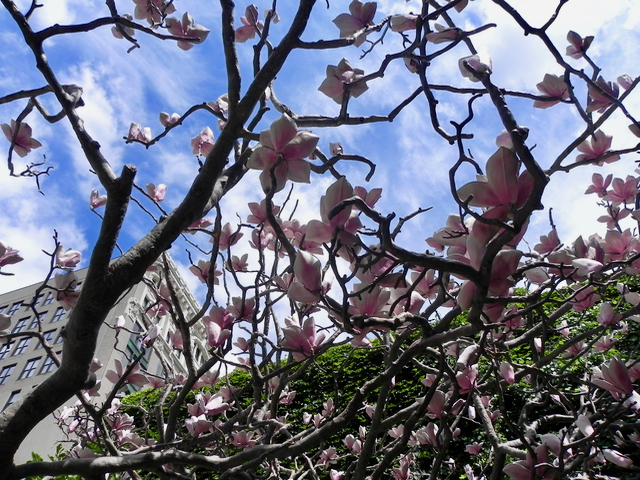 These magnolia trees never lose their blooms. Using bike lanes, we moved north to the Pittsburgh Cultural District where an artist named Tony Tasset has created magnolia blooms that can be enjoyed year-round. Here Val talked about John Heinz, the late politician and native son who worked with the Pittsburgh Cultural Trust to revive the area’s façades and building and to sponsor performances and public works of art. 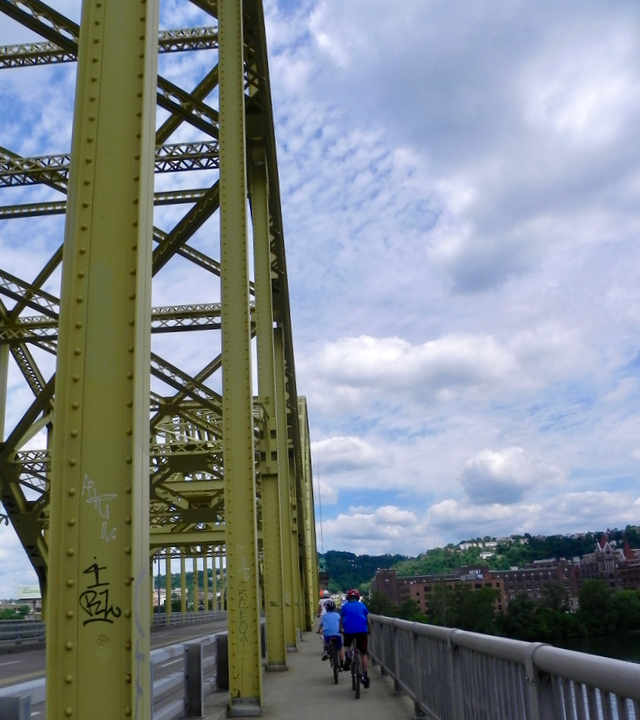 We headed through the Convention Center, which swoops out over the Allegheny River and has a walkway designed for pedestrians – and cyclists – that runs under the building. I wish I had snapped a photo as we rode through as the path descends seventeen feet from Tenth Street to a plaza overlooking the river. The path is sinuous and surrounded by both pools and walls that flow with water. The boys loved it and I loved watching them so much that I forgot to pull out my camera. Even if you don’t take a bike tour of the city, I highly recommend wandering down here as it’s the kind of public space that children really enjoy. We rode for a while along the river, through a former industrial area that is slowly being reclaimed by nature and gentrification. Our next stop was on the edge of an area called The Strip, which in the early 19th century was home to the mills and foundries that drove Pittsburgh’s economy, including Andrew Carnegie’s first mills. The neighborhood changed in the late 19th and early 20th century and became the hub of wholesale produce distribution in the city. Many of the old buildings associated with these industries have been repurposed as apartments or studios and the neighborhood is now a mix of restaurants and shops selling food, spices and goods from all around the world. We someone how squeezed our bike caravan down the busy, brilliant streets past a rainbow of sundresses billowing in the breeze, past a small church with a gray steeple that for many years was used not for mass but as a concert venue and bar but was now being reconsecrated and used for worship again, past murals and Steelers t-shirts and a fish market. It would have been easy to spend the better part of a day here. Val teaching Teddy all about the Heinz Factory. We crossed the Allegheny at the David McCullough Bridge, named for the famous historian and native son and rode around the perimeter of the original Heinz Factory, once the site of the manufacture of my younger son’s favorite condiment and now converted into expensive lofts where players for the city’s professional sports franchises and employees of Uber and Google live. We even saw Uber’s self-driving car, which the company is testing in Pittsburgh. I prefer the original Alcoa Headquarters. 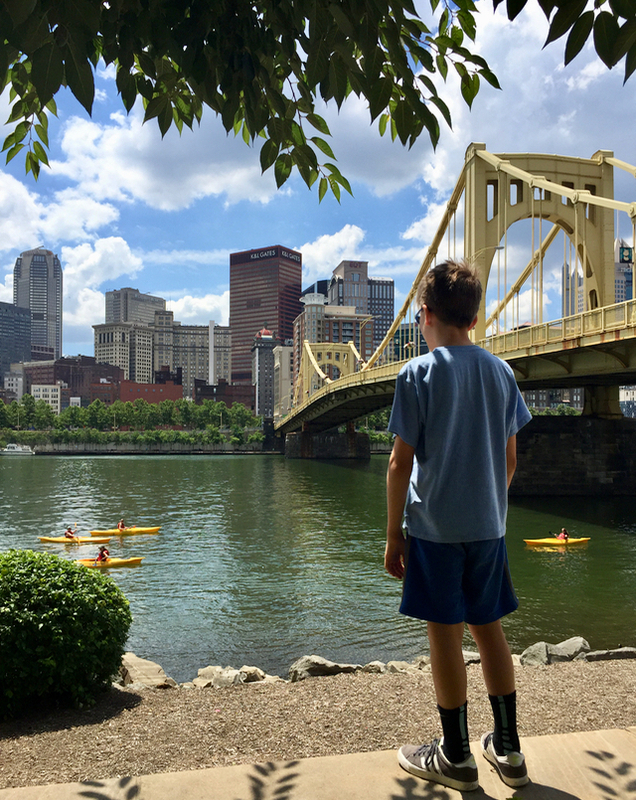 We rode along the Allegheny River taking in views of the Three Sisters, as the trio of graceful yellow bridges that cross it are called, and the kayakers paddling underneath them. 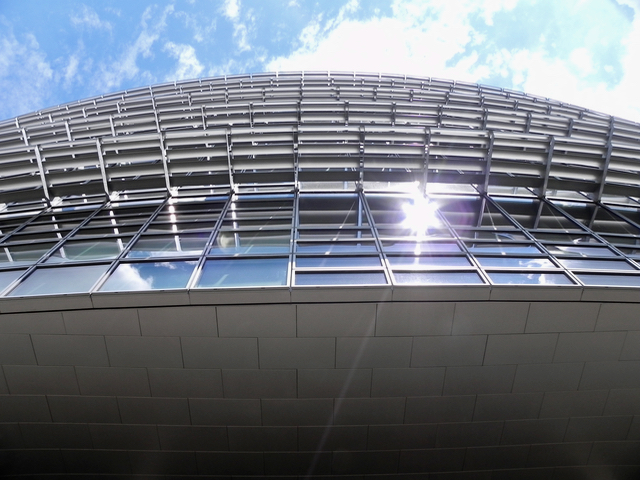 This portion of the ride included views of the baseball and football stadiums as well as the new Alcoa Headquarters, perhaps not quite as interesting as the old but equally gleaming and geometric. Teddy looked ready to try kayaks next. 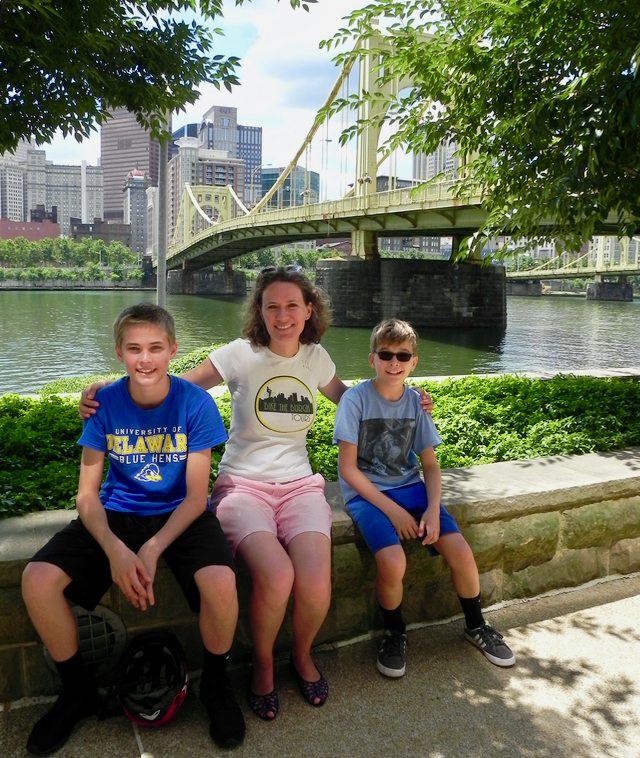 After crossing the river back to the downtown area, we took a quick tour to the tip of the city where Fort Pitt once stood and which is now home to the Point State Park Fountain. Val then led us to the nearby Market Square, which was laid out in the late 18th century and still feels older than many other parts of the downtown (Val said she likes it because it feels European). 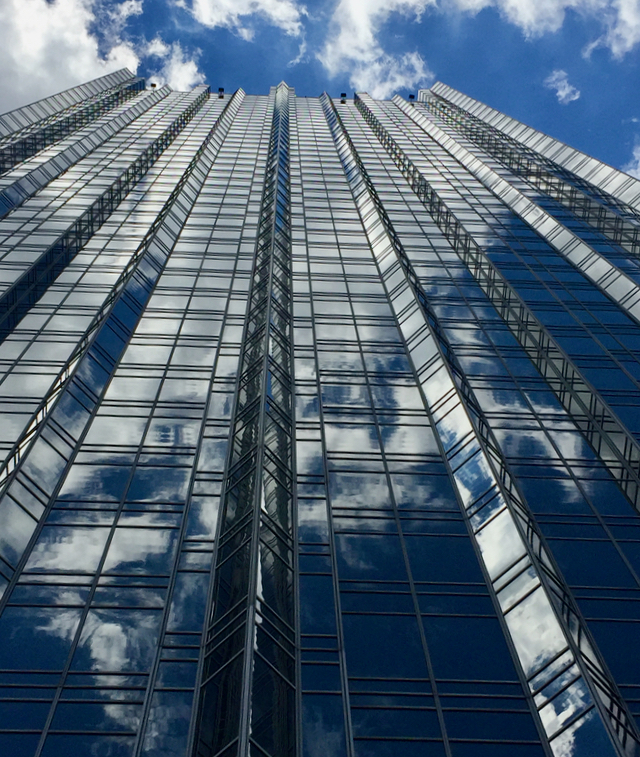 The square was full of a farmer’s market when we arrived and made our way over to the adjacent PPG Place, with its domineering Philip Johnson-designed castle of glass. The PPG building has to be one of the most photographed in the city. It was full of children playing in the water jets – I could see the boys wishing they were wearing their swim trunks. If you’re looking for a place to cool off in Pittsburgh, this is it. By now it was time to say good-bye to Val and the group, who headed back to the starting point, because both my boys were ravenous. Happily Val recommended that we lunch at Primanti Brothers right there in Market Square. This local favorite, which actually started as a food cart in the Strip District, serves French fries and coleslaw inside its sandwiches. 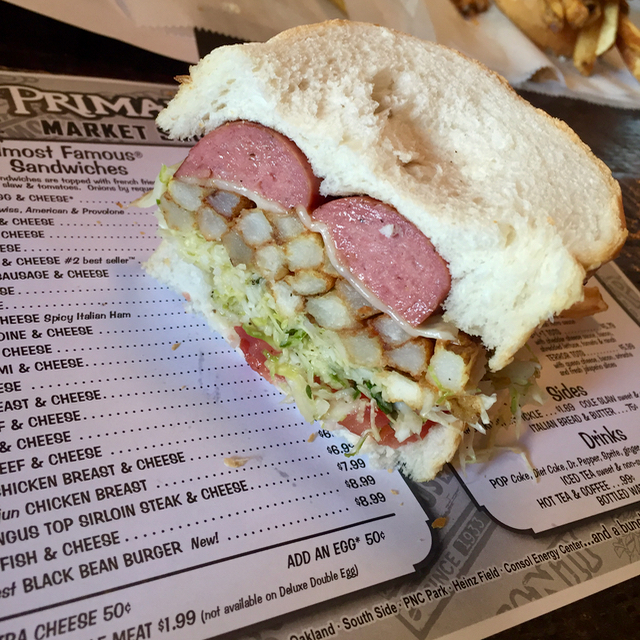 They put everything inside the sandwich in Pittsburgh – and I mean everything. Thanks to Val, I definitely felt like we had started to get to know Pittsburgh. It was the perfect introduction. We all loved Val – she was friendly, enthusiastic and knowledgeable. Val offers a number of different tours year-round in all kinds of weather (although not in “rain, snow, or ice” as her site says). 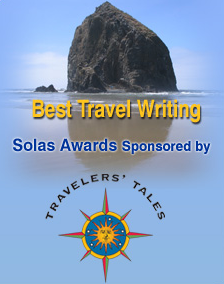 Tours during the colder months are offered by reservation only – check her website for details. During nicer weather it’s a good idea to book in advance, especially on the weekends when the tours tend to fill up. Our Beauty of the Burgh tour was pretty much completely flat and only about 7 miles. We stopped often so that Val could tell us things, so there was plenty of time to rest. 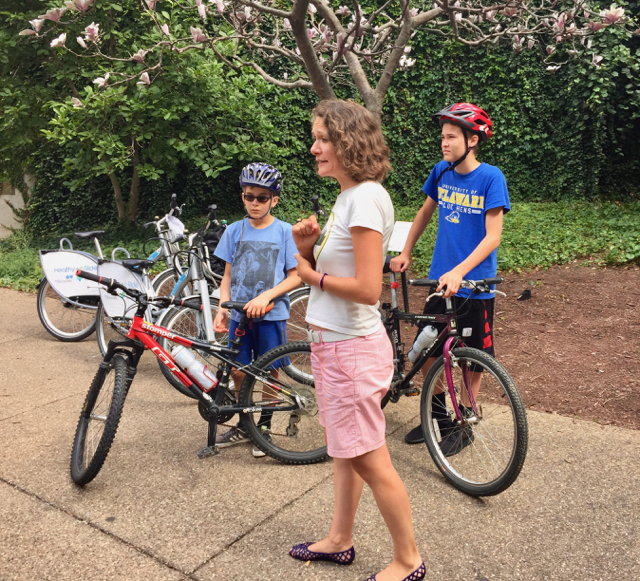 We had our own bikes and helmets, but there are several options for visitors who don’t have bicycles with them – Val has a deal for a discounted rate with a bike rental shop (they close in the winter, so this only an option in warmer weather). She also starts her tours near a bike share stand where bikes can be rented by the hour using a mobile app and returned at a different location. 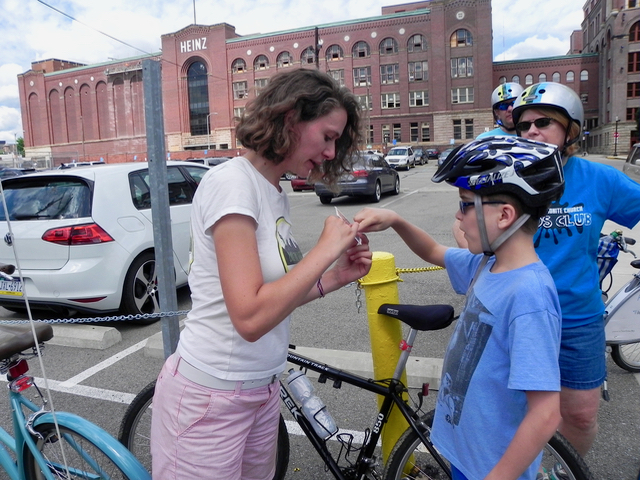 The bike share bikes are one-size-fits all and will only work for older kids who are tall enough to ride them. And if you stay, as we did, at the Hotel Monaco, the hotel has bikes you can use. Although rental shops usually offer helmets, if you’re planning to rent bikes on a trip and have a way to bring your own helmets I always recommend doing so – that way you know you’ll have the best fit for you and your kids. Val also offers tours in German. 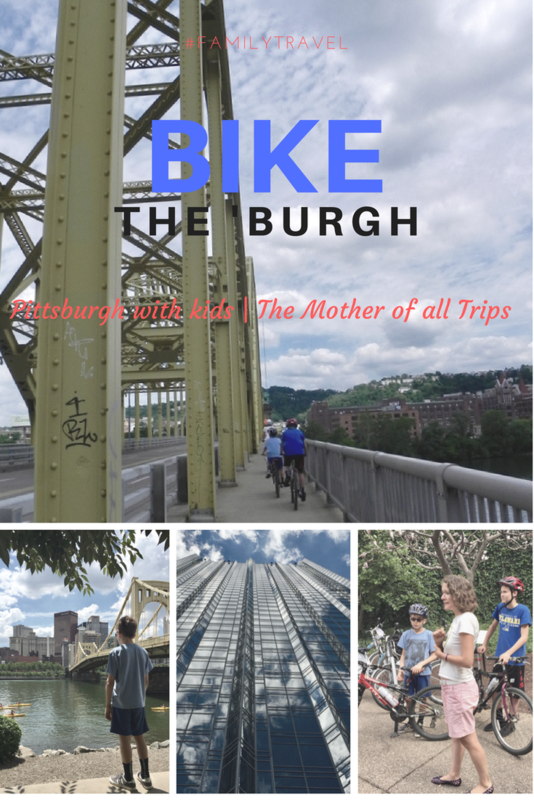 If you’re interested in biking Pittsburgh on your own, BikePGH offers downloadable bike maps as well as link to other cycling resources.